In his essay yesterday about “State Culture, State Anarchy,” Elliott Colla very briefly touched on author Sonallah Ibrahim’s 2003 put-down of the Egyptian state cultural apparatus. I have no doubt that every Egyptian here is aware of the extent of the catastrophe facing our country. It’s not just the real Israeli military threat to our eastern borders, the American dictates, or the weakness showing in our government’s foreign policy: It’s all aspects of life. We no longer have theater, cinema, or scientific research; we just have festivals, conferences, and false funds. We don’t have industry, agriculture, health, or justice. Corruption and pillage spreads. And anyone who objects faces getting beaten up or tortured. The exploitative few have wrested our spirit from us. All that’s left for me is to thank those who chose me for this prize but to say that I won’t be accepting it because it is from a government that, in my opinion, does not possess the credibility to grant it. All of Sonallah Ibrahim’s novels that have been translated into English—a pitiful handful—reflect the Egyptian state apparatus in some way: The Committee is an examination of humanity and censorship, Zaat on the day-to-day corruptions of society, and Stealth on an Egyptian child’s difficult coming-of-age. Ibrahim’s speech apparently affected other Sixties Generation novelists, as—after Ibrahim turned down the award—it was difficult to give away the once-prestigious prize to anyone. During the next award cycle, prominent Sixties Generation novelist Gamal al-Ghitani told state-owned Al Ahram that he’d refused to be shortlisted for it. He noted that a number of other Egyptian authors had taken the same position. 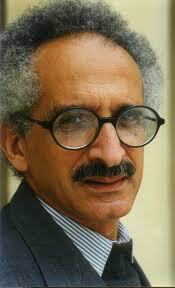 In the end, the 2005 award went to Sudanese novelist Tayeb Salih. In his obsession with purity of life, with honesty, with reform, as well as puritanical and retributive justice, Zayni corresponds with Gamal Abdel-Nasser, also a popular figure, genuine reformer, [and] ambitious patriot. … El-Ghitani’s disenchanted reflections upon the past directly associate Zayni Barakat’s rule with the murky atmosphere of intrigue, conspiracy and multiple schemes that characterised Abdel-Nasser’s rule during the 1960s. And, as Elliott Colla points out in this site’s comments section, one of the novels that most directly reflects the current uprising—illuminating the differences and similarities between the 2011 uprising and the 1977 bread riots that nearly unseated President Anwar Sadat—is The Heron, by Sixties Generation author Ibrahim Aslan. This lovely short novel was translated by Colla. …and then heading to Talaat Harb Square where the first things you saw were the circles of people gathered around a student, and the large crowd where you stood and the fair man with short brown hair debating that student in a calm voice in front of all the people, talking about the state of the country and the occupation of the Sinai which made it necessary for everybody to disperse adn go back to their business. This man’s eyes, arching wide, full of warnings and threats, were staring intently into those of the student. You’ve never forgotten that glare. You’d recognize that face in a pile of decapitated heads, but you’ve never written about it. You believed Abd al-Qadir immediately when he told you that it was people from the secret police who staged such discussions in order to get everybody to think that they alone were the rational citizens taking a stand against anarchy, and to make the students look like a bunch of irresponsible hotheads making some mistake. Abd al-Qadir knew all that without actually looking at the man, and he knew all that without ever leaving his seat at the cafe, but you, you don’t know these things and you’re unable to believe in things unless you see them with your own eyes. You didn’t write about the people who crowded the sidewalks to watch but you did write about others standing behind them, tottering on their toes to watch the mass demonstration and the riot police lined up in front of the Air France office with their night sticks and neat shields and your leg that got injured when you collided with the metal garbage can in front of the building while you were trying to get to the cafe…. You wrote about how you sat with everybody in the passageway at Cafe Riche and the small fliers which Fathi wrote out with the ball point pen and how each person took a sheet of paper and folded it over a piece of carbon paper and copied out the written statement and made two copies and then tore the sheets in half and put them on the stack on the table. You wrote about how the others like you sitting in the back of the cafe were forced to sit cross-legged and copy things using their knees as tables, and each time you stood up and leaned over those who were sitting, you had to stretch out your hand to put the two pieces of paper on top of the other copies…. Well: Thank goodness for laser printers and Twitter. Another Sixties Generation novelist I’d like you to read is Yahya Taher Abdullah, whose The Collar and the Bracelet was translated by Samah Selim and published by AUC Press. I suppose the short stories of this collection are not really about revolution, but, in any case: lovely.